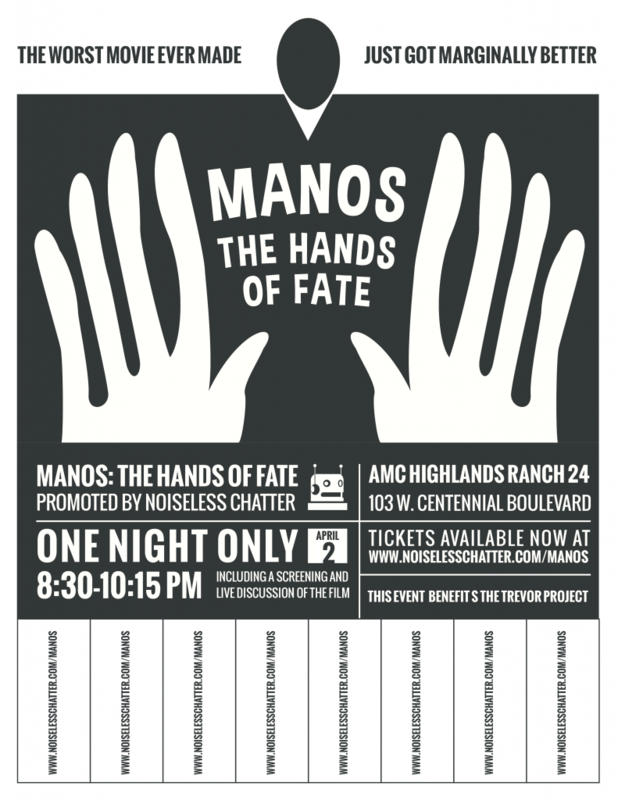 Tickets for “Manos” The Hands of Fate on Sale Now! The live screening of the remastered / restored “Manos” The Hands of Fate is happening April 2, and you’re invited. All proceeds benefit The Trevor Project, and you’ll get to enjoy a great night out with a terrible movie and excellent conversation. Tickets are on sale as of today…and a few have already been sold! We need to sell quite a few more, though, in order for AMC to host the event. Think of it like a Kickstarter. You don’t get charged unless the event actually happens. By purchasing a ticket, even if you can’t make it, you’re helping the event to happen, benefiting charity, and scoring yourself some sweet Noiseless Chatter swag. Additionally, everyone who buys a ticket will be invited to a special, private, online screening / discussion of Tommy Wiseau’s masterpiece of incompetence The Room. Even if you can’t make it to “Manos” (but I sure hope you can!) you can enjoy The Room. I really, really would like to attend. But I will not be in Colorado then. In fact, I will probably still be on crutches. I suffer while the Noseless World of Chattering lives long and prospers… sigh. Speaking of which, are you going to do a Spock write-up? And probably not a Nimoy writeup. I wouldn’t be able to do him justice, sadly. Having said that, the door is open for somebody who was more familiar with his work.